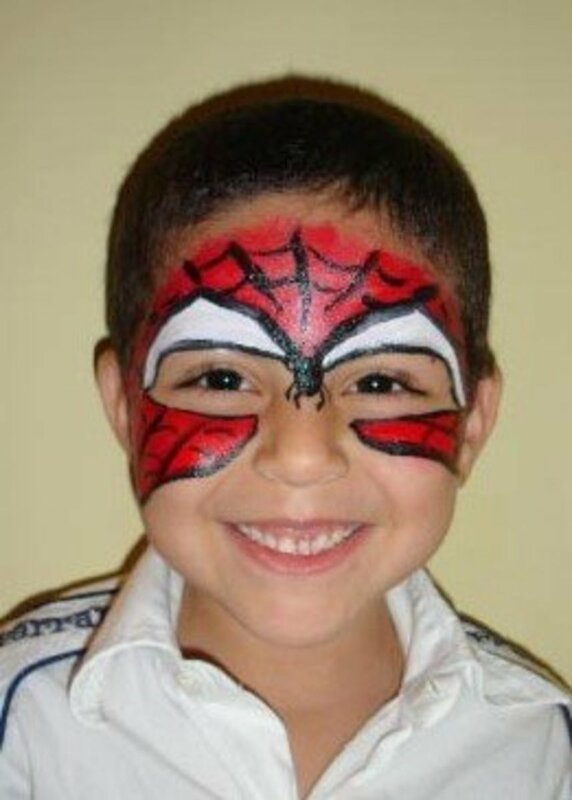 Spiderman continues to be one of the more recognizable and popular super heroes out there, and as a result children love to get face painted with the image of the webslinger, which isn't that difficult to do. Spiderman, as most of know him, has a red mask, white eyes, and a web design of a spider web on his face. Some people depict the spider web on Spiderman with black lines, others with white lines, and still others with darker red lines on a light, red hue background. Whatever the choice, children don't care as long as when they look in the mirror they see a similarity between themselves and their super hero friend. 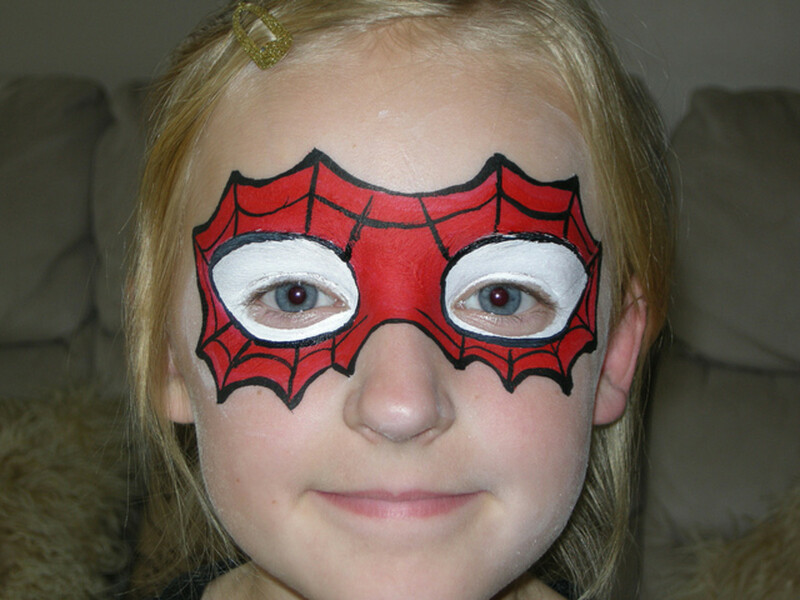 And for those that don't want their entire faces painted in a Spiderman mask, there are some that include the image of a mask; looking like one you would buy and place over the eyes. Finally, some choose to get a little creative, leaving the space over and around the mouth with a solid red color, with the rest of the design looking similar to the traditional Spiderman design. 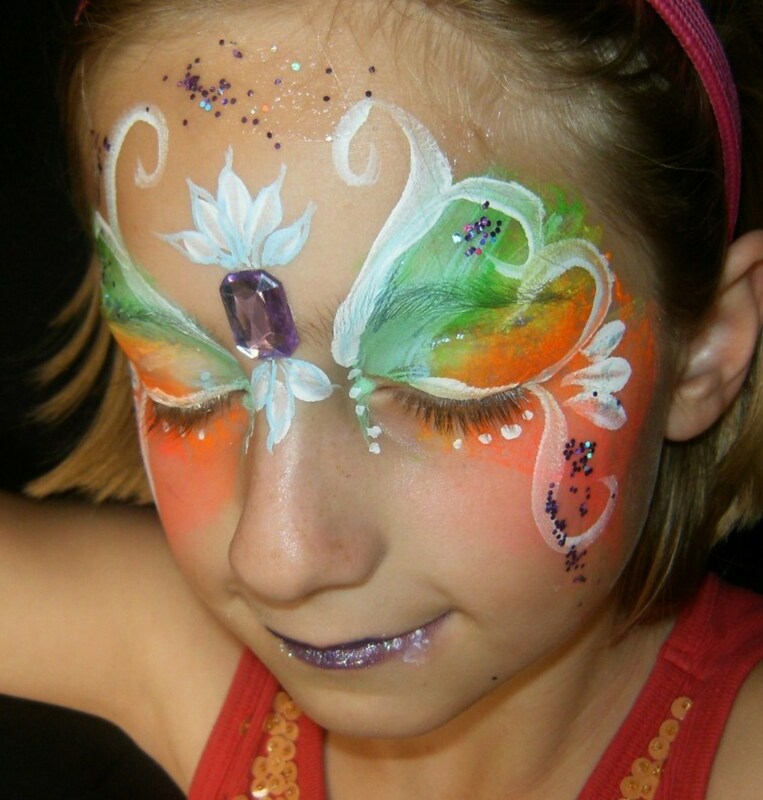 Now let's look at some photos and video tutorials of Spiderman face paintings. 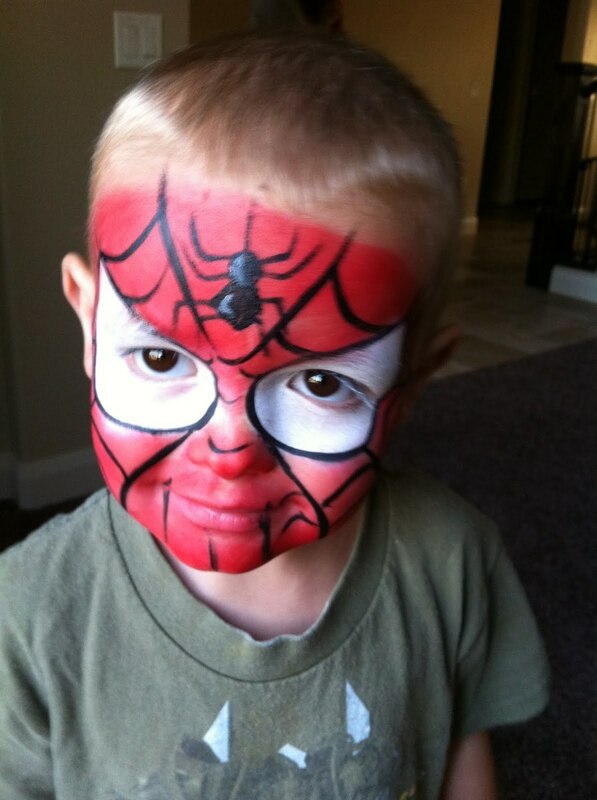 We'll start with this Spiderman face painting design because the look is by far the one most embraced by the majority of those getting the Spiderman look. When saying that, I'm referring to the red foundation and general look of the web. Many times the eyes, while mostly white, can have a very different shape, depending on the desired look and artist applying it. As for a quick tutorial on how to create this general Spiderman design. First you apply red paint to the overall face, leaving a part of the eyes free for the white paint. Some people actually apply the white around the eyes first and add the red later. Either way doesn't matter. Just be sure to add some black around the eye to help define it. Once the red base and eyes are completed, from there you simply add the web to complete the look. There you just draw a series of line from one part of the face to the other, as you see below, and then add the slightly curved lines to make create the web look. It's as easy as that. 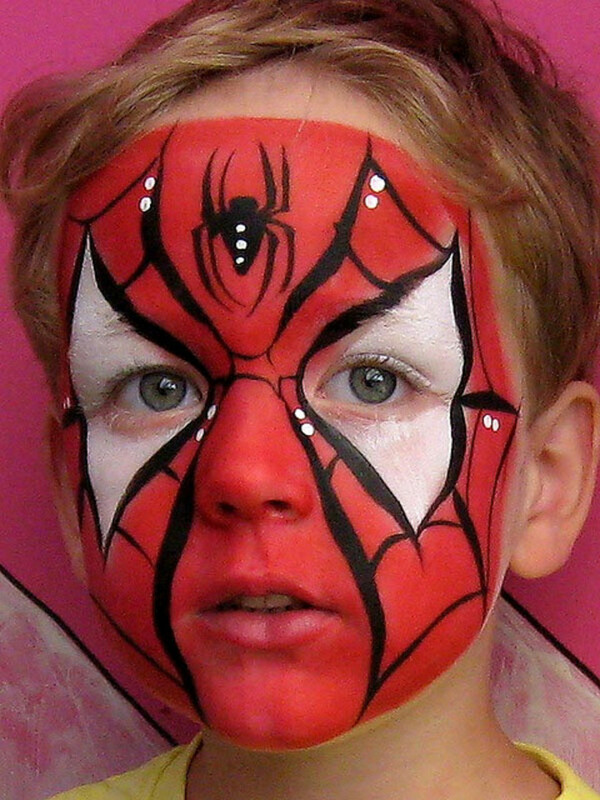 One unusual thing about this Spiderman face painting is how there was a fairly wide area left around the eyes that was bare skin. I think this is done by some people who are concerned they may accidentally touch the eye of their child with paint, or the child isn't comfortable with have the paint that close to the eyes. 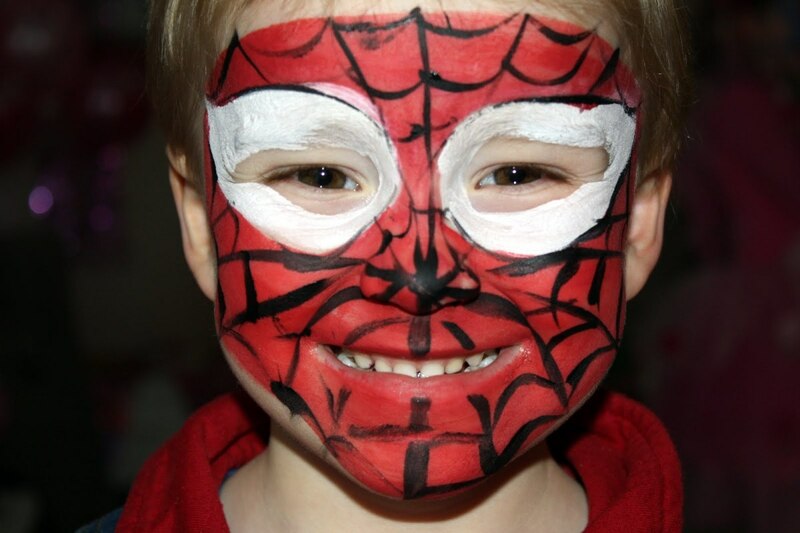 But as you'll see below, there are a variety of ways to face paint Spiderman, and once you get these basics, you can adapt or adjust the basic elements for some more distinctive and creative looks. 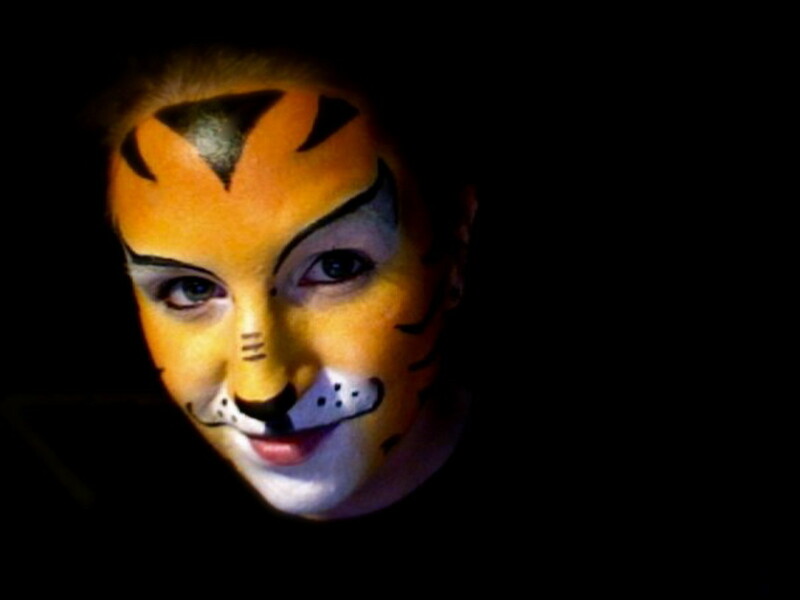 The next couple of photos will show how you can work from the base mentioned concerning the first Spiderman face painting design, and add a couple of changes for a different look. Obviously the immediate change noticed below is the spider in the middle of the forehead. That is a popular way of adding something to the original Spiderman face. Also different is the shape and size of the white eye area. That is one of the things that can easily be played with and manipulated in an easy manner. Lastly, the decision to not create a web look on the chin area was interesting. There you have the straight lines rather than the additional curved ones as in other parts of the design. But as you can see, it doesn't take away from knowing who this little guy is portraying. And that's all that will matter to him. Next we have a cool example of adjusting the shape of the eyes to make a totally different Spiderman look, while retaining the feel of the character. Also interesting is the way the area around the mouth was covered with red, but excluded the spider web of the mask. I also like the spider and the little white dots scattered across the face. it's a nice, unique design. 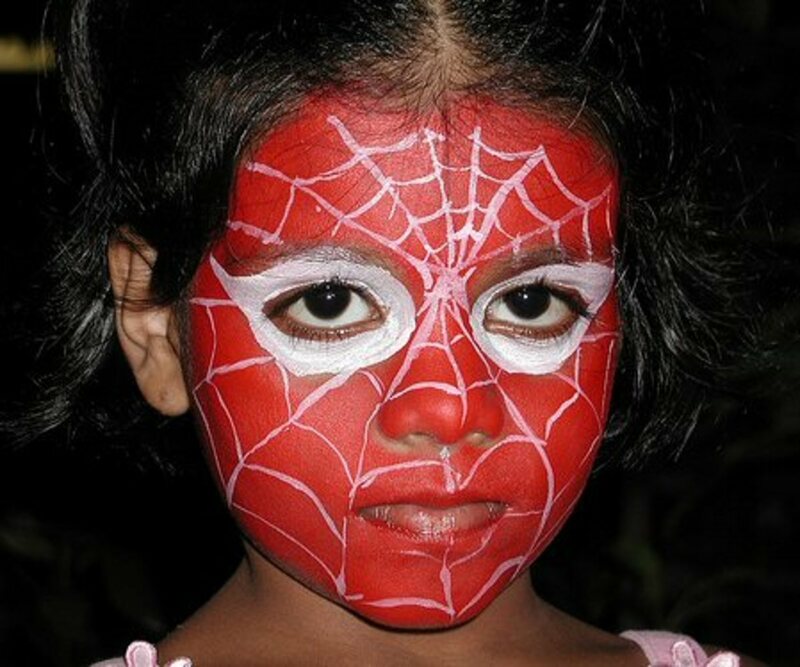 For those who learn better visually, here are several video tutorials on a variety of Spiderman face painting designs for children. Of course if you're an adult who wants to have a face painting of Spiderman applied, just take these same tips and use them for yourself. As you can see from the photo below, little boys aren't the only fans of Spiderman. This little girl has a wonderful web design, differentiated and highlighted by the decision to go with white as the color of the web rather than the usual black color. It actually works very well, and even if there is another Spiderman at the gathering, no one would have this particular look for sure. Going with a cat eye shape for the eyes was also pretty cool; one that a girl can get away with while looking great. 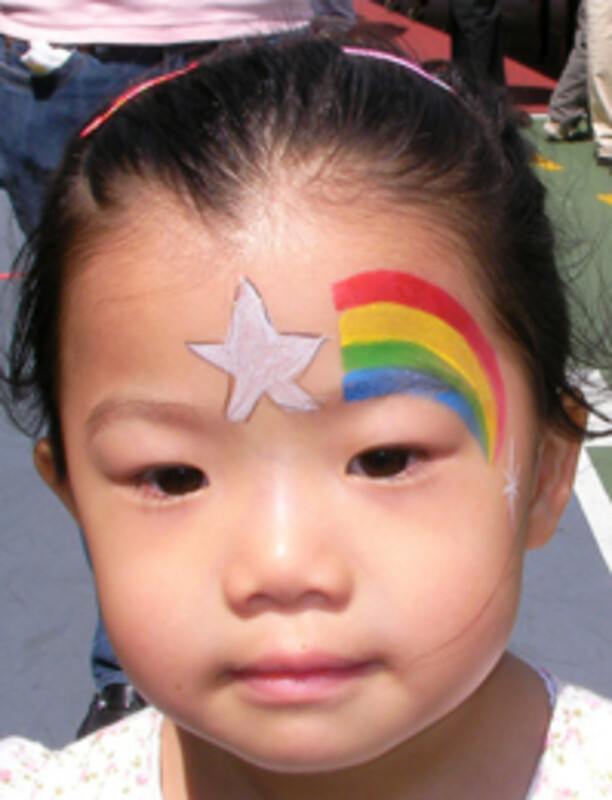 While all the Spiderman face paintings could properly be called masks in this article, I define the next couple of designs in that manner specifically because it covers only part of the face of each child. With that in mind, both of them look fantastic, and offer up a very unique look while still being easily recognizable as to who they are representing. 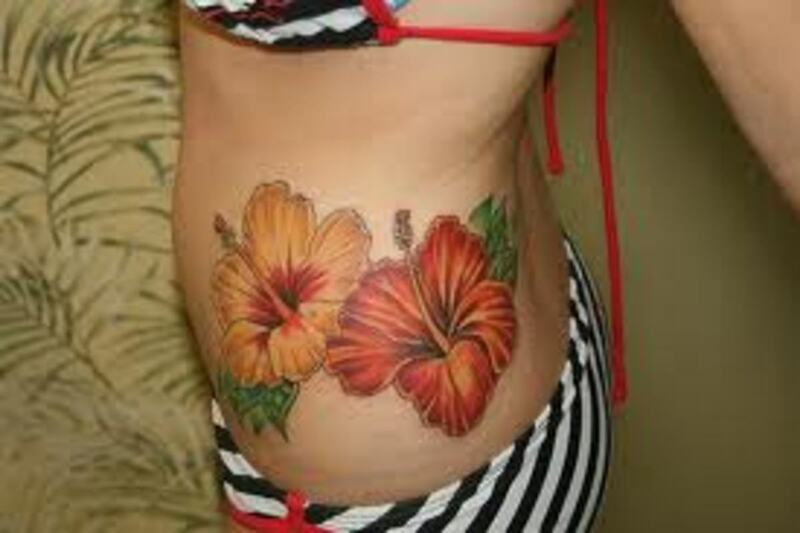 The first one has a nice way of extending below the eye to get that interesting look. I like the way the white was applied above the eyebrows to accentuate the rest of the design. Having the spider placed at the bridge of the nose was also a great idea. 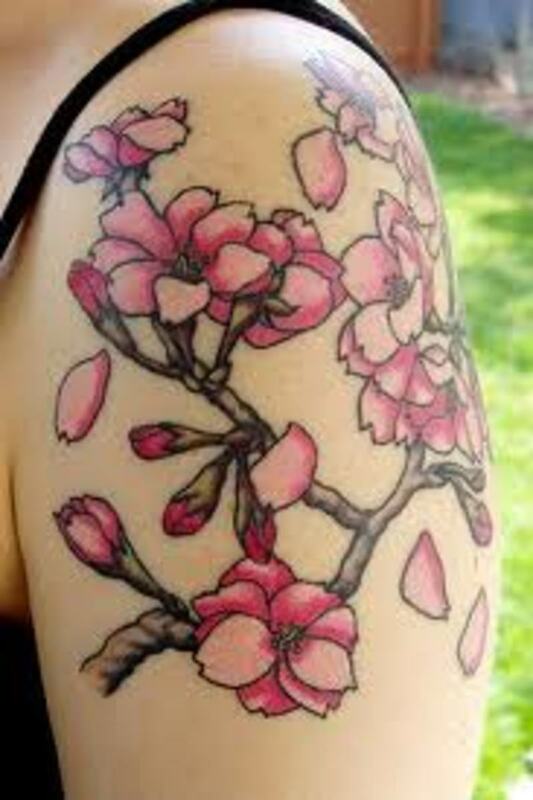 Like this this one. As for the following Spiderman face painting mask, it's completely different than the first mask. Here there is a more pointed design, with the mask covering almost exactly where a real mask with an elastic band would. This is a very cute Spiderman mask as well. When considering the simple look of the Spiderman character all these face paintings were based upon, it's amazing the creativity and unique looks that emerged in the designs. Every one of them would be enjoyed by a child, although some would surely like to have their faces covered completely to look like Spidey as he really is. 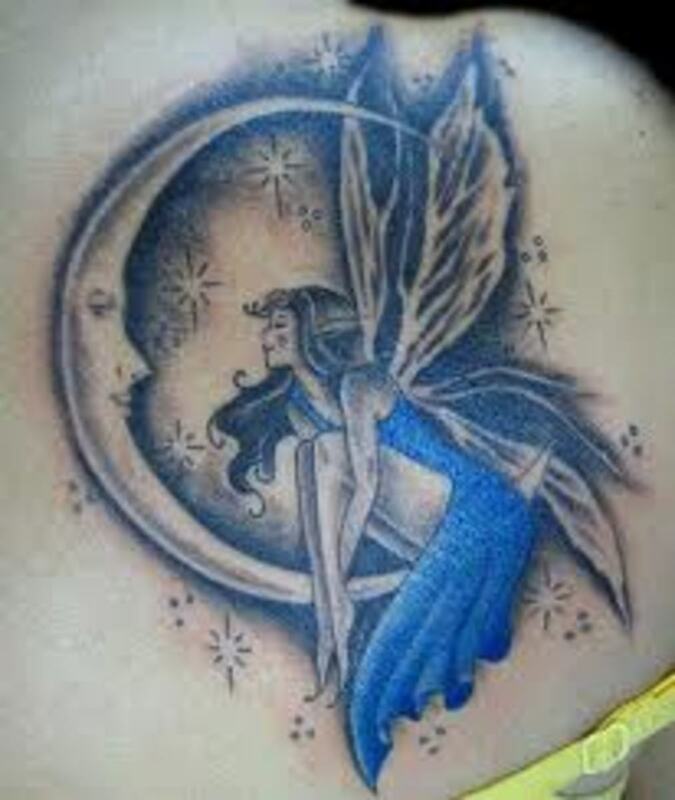 Others I think would like to experiment for their own look that helps them stand out from the rest of the crowd. 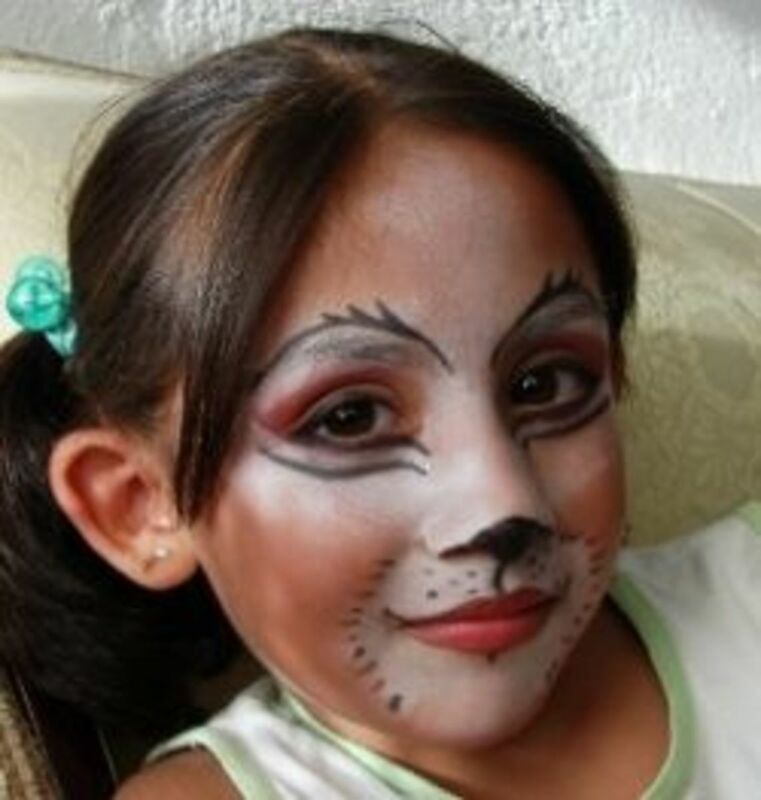 However it's done, a Spiderman mask face painted on a child is sure to delight them, and it's not that hard to do for even the average person. Now all that has to be done is see if this is what your child would like for this Halloween or a costume party.